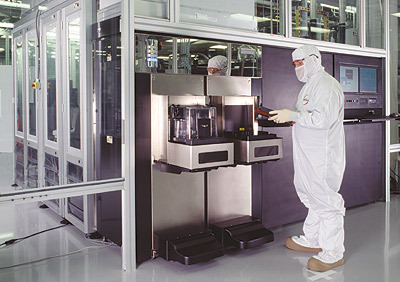 An Equipment Front End Module (EFEM) is the mainstay of semiconductor automation, shuffling product (silicon wafers or quartz photo-masks) between ultra-clean storage carriers and a variety of processing, measurement and testing systems. It contains the key components needed to unload product, deliver it to the parent tool for processing and return the product to its carrier upon completion. EFEMs were developed in response to the demand for higher yields and throughput, which have been further driven by ever-shrinking geometries in integrated circuit production. As features get smaller and smaller, contamination levels that were acceptable previously have become intolerable. In many related industries, such as metrology, the competition to achieve measurements of higher resolution and accuracy is requiring similar attention to reducing contamination. One of the most important methods to accomplish this is to automate the process and thereby remove contamination associated with product handling by an operator. Concurrently, the semiconductor industry has driven equipment standards to guarantee commonality of physical design, product handling strategies, communications interfacing and operator controls between different equipment manufacturers. One benefit of standardization is the development of "bolt-on" modules, such as off-the-shelf EFEMs, which can be quickly and easily attached to a tool and operate as slave devices under the control of a factory host or parent tool; much in the manner that a printer is controlled by the computer to which it is attached. However, off-the-shelf EFEMs do not address laboratory and other low-throughput equipment markets which are unwilling to pay the increased cost associated with industry standardization. In addition, semiconductor EFEM manufacturers are reluctant to customize standard product in low quantities for specialty applications. This means that many manufacturers receiving automation queries cannot turn to off-the-shelf EFEMs to automate equipment. As a result, the customized EFEM market has evolved to address the automation, handling and control needs of existing tool designs. Users with custom requirements who consider purchasing an off-the-shelf EFEM are often saddled with significant adaptation problems in the process of integrating the typical EFEM with its parent tool. Clean Work Cell Environment - an enclosed product handling area within which the product is processed. It is continuously kept clean through the use of high quality fan filter units, which provide a laminar air flow that blows contamination below the perforated work surface and out of the tool. The level of cleanliness is defined as Class 100, 10, 1, or in nanosciences, Sub-Class 1. The environment should incorporate aerodynamic considerations and often includes ionization bars (to reduce static) and specialized lighting. Load Port(s) - One or more devices that receive a sealed carrier of product, open it to exposure from within the clean work cell environment, and reseal it when the processed product is returned. 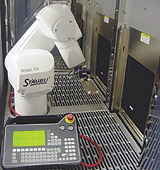 Robot - a device that can be programmed for accurate, repeatable product manipulation. Control Interface - a method of telling the EFEM what commands to execute. Accessory Fixtures - for flipping, alignment and/or orientation of the product. The ability to enclose the processing area of the tool in an ultra-clean environment in order to improve product handling. Full support for atmospheric-to-atmospheric or atmospheric-to-vacuum product transfers. This includes integrated vacuum systems and associated transport, handling and control. Supervisory control from a single Operator Control Station to monitor/ control the entire integrated tool. Software operation and screens that provide full automated functionality, while preserving full parallel access to the tool-specific software. Transparent interfacing between the Operator Control Station, installation environment and the application tool. A robot and end effector designed around the handling needs of the product. A single facilities input point, with distribution and control of power, process gases, control air, house vacuum, etc. to all areas of the tool. Full attention to safety interlocks, compliance engineering and third-party certification. Full access to EFEM and tool maintenance areas. Custom-tailored packaging which provides a look consistent with a clean, unified product. Fala Technologies has been privileged to work with leading-edge scientists on a variety of nanoscience projects, as well as R & D equipment development. This has allowed us to develop in-depth experience and knowledge in the design, manufacture, installation and evaluation of custom EFEMs. In response to our customers' increasing needs to fit front-end automation to existing R & D semiconductor production, inspection and metrology systems, Fala Technologies Inc. has turned its attention to the custom EFEM market.